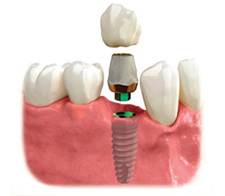 Dental implants are the new standard of dental care for tooth replacement. They can restore your appearance, speech, nutrition, oral health, comfort, and self-esteem. Losing one or more of your teeth creates a gap in your smile, affects your ability to chew properly, can accelerate bone loss, alter your diet and nutrition, and can leave you with an unattractive smile. With dental implants, healthy teeth are not compromised. 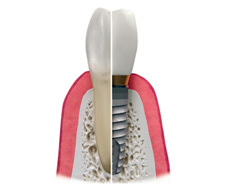 Dental implants, like natural teeth, stimulate the jaw and stop bone loss. Dental implants bond with healthy bone and provide permanent support for dental crowns and dentures. They look and feel like natural and can last a lifetime. With single and multiple missing teeth, the implant is placed in the bone beneath the gum, and the abutment and final crown are custom made to match your existing teeth. At Concept Dental, Dr. Rickards will use the Cone Beam 3D Imaging and create a model of your existing teeth to determine the optimal implant position. Occasionally, a bone or gum tissue graft will be necessary to create adequate space for the implants. Dental implants are placed into the bone, and then the bone and gums will be given time to heal before an abutment and crown are attached. Your final crown will be placed once the implant has bonded with your bone – restoring your natural smile.